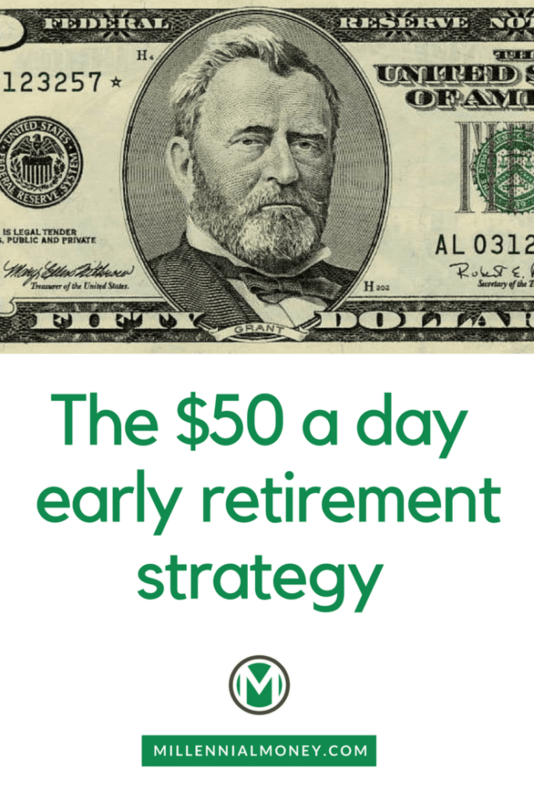 I was able to retire early at the age of 30 using the exact early retirement strategy in this post. While you might be thinking, how can you retire at 30? Well it’s important to first define what early retirement actually means to you. Here’s what it means to me. 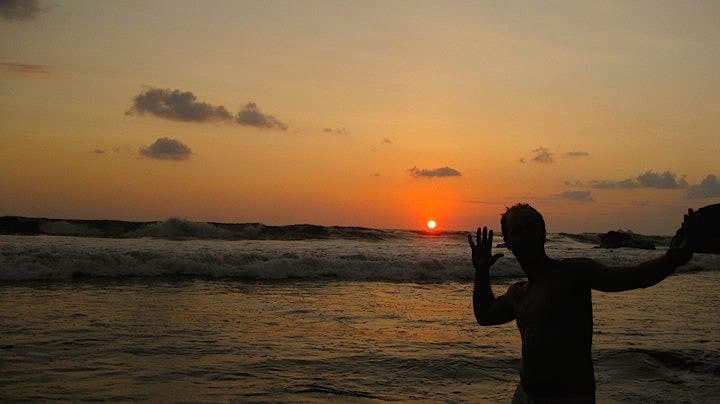 Early retirement is no longer defined as the moment when you stop working forever, it’s simply the moment when you no longer have to work for money. But you can choose to keep working, like I do, if that’s what you enjoy doing. It’s been scientifically proven that working is actually good for you and many people who completely quit working start losing their mental faculties and people who retire early might actually die sooner. So to me early retirement means being able to make the shift from work you have to do to work you want to do. The old school idea that when you retire you are done working, is just that, an old school idea. Now that we’ve got that settled, let me show you how I got retired early and you can too. While this is a hotly debated topic in the early retirement community, based on a series of papers known as the Trinity Studies, you need to save approximately 25-30x your expected annual expenses to have enough money to last you for the rest of your life. This multiple is based off of what’s known as your expected withdrawal rate, which is the percentage of your investment growth that you would be able to withdrawal per year to live on. Based on this study (and many others) a safe early retirement withdrawal percentage is between 3%-4% adjusted for inflation (meaning you can also take out an additional 2%-3% per year depending on inflation). Here’s how to calculate how much money you need to retire early. First, figure out how much money you are spending each year by tracking your expenses using a free tool like Personal Capital. 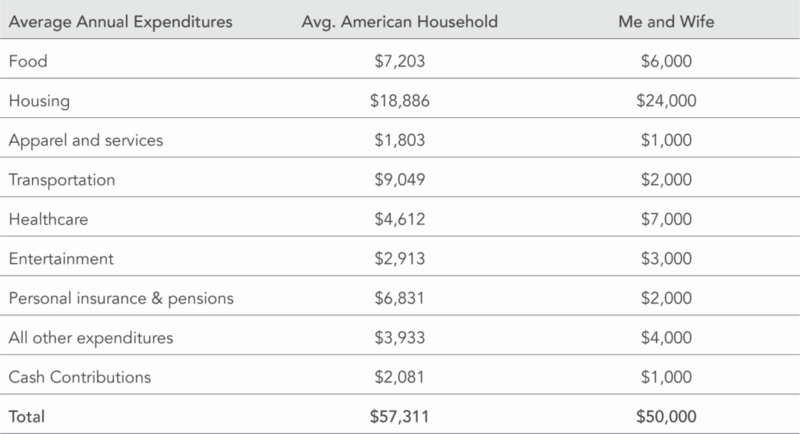 My wife and I spend approximately $50,000 per year and here’s an approximate breakdown of our expenses by category. Using myself as an example, if you spend about $50,000 per year, then you need to have somewhere in the neighborhood of ($50,000 x 25 = $1,250,000) to ($50,000 x 30 = $1,500,000). It’s important to note that this is how much money I currently spend, not how much I will necessarily be spending in the future, but it’s a great starting point for setting an early retirement goal. This is the single most important hack I’ve used to build wealth. It’s easy. I break down ALL of my money goals into daily goals. I still deposit money every day into my investment accounts and track my net worth for free using Personal Capital. Our minds are built to think about today. Our ancestors weren’t able to comprehend years into the future. This is one of the reasons it’s so hard for us to save money. You’ve probably tried those retirement calculators or have used the retirement projector at Personal Capital. Most of the calculators come out with a number you will need to “retire” based on your inputs and current progression. The numbers are usually big and run into the millions. BUT SERIOUSLY? Who can save $1,272,000 dollars? I was barely able to buy a burrito when I first started. These numbers are so large, they seem impossible to reach, don’t resonate with us, and actually discourage saving. But, backed by academic research, a lot changes when we start thinking about money in daily increments. Learn how I used this hack to transform my savings and reach financial independence. If are nerdy like me and want to go deeper on this topic check out the research of USC professor Daphna Oysterman here. There’s an easier way to retire early and reach financial independence. 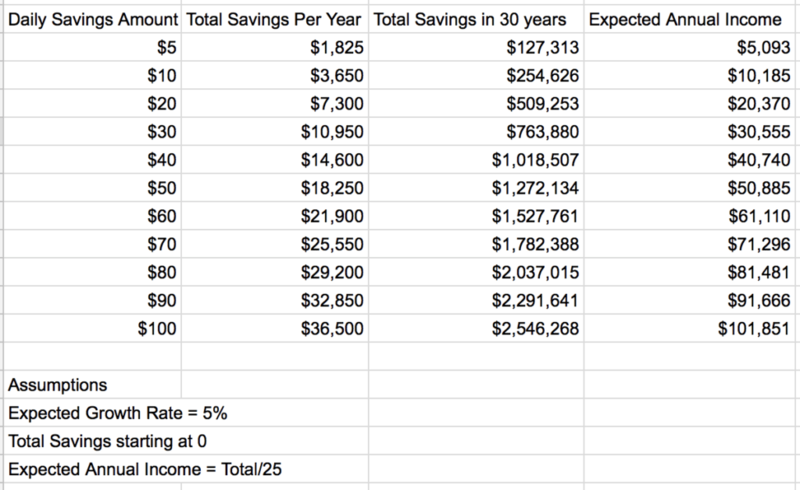 I did some calculations and determined I needed to try and save approximately $50 a day in order to reach financial independence in 30 years. It can’t be a coincidence that I needed to save a Grant a day! It’s a simple calculation I did using a basic compounding interest calculator. In order to get to $1,250,000 I needed to save $50 a day and have an expected 5% annual compounding rate (a pretty reasonable expectation over a 30 year period). Thinking about it in annual terms I needed to save $18,250 a year. Max out that 401K! But 30 years? Forget that. Then I started really thinking. If I could save even $51 a day then I could fast track my financial independence. This was a mind-blowing moment for me. Just $1 more per day. I was hooked. To figure out when you can retire early, check out this early retirement calculator that I built. I started depositing as much money as possible every day into my investment accounts. I downloaded the Vanguard app and literally make deposits every single day directly into my investment accounts. Some days it was only $5, but I rarely missed a day. Then I started a side hustle and put 100% of what I made directly into the same Vanguard account. I barely let deposits clear my bank account. The minute I saw the money in there I put it into an investment account. I got really stoked when I was able to pass the $50 a day deposit threshold. I started to feel in control. I knew that I was ahead. Every day that I deposited more than $50 I was ahead in my retirement savings. Then I started trying to make as much money as possible every day so I could invest it. I stopped thinking long term and thought every day about making that $50 threshold. When I got a bonus or new client those we just bonus points. BOOM, right into my investment account. Do your own calculation – you might need a lot less. Here is how much you need to save per day to reach your number. Depositing money into my investment accounts every day felt, and still feels, like a game. $50 went from being my daily goal to being my daily minimum. I started depositing $70, then $80, then $100 dollars a day. Then as my side hustles started really taking off I started deposit $500+ a day. Every check I got I put as much in as I could that day, but still kept my daily $50 deposit goal. Then I put $5,000 in a day, then $20,000 and the rest is history. Using this early retirement hack I was able to reduce my 30-year saving plan down to just 5 years and reach financial independence! I still do this to this day. Now I automate most of it and simply have the money pulled out of my account and put into vanguard. My current minimum threshold is $200/day. But you can start at any level that is comfortable for you. There are a ton of ways you can take this idea and run with it. Try depositing $5/day to start and then increase it $1/week. Trust me you probably aren’t going to miss that extra dollar. There are a ton of apps you can use like Acorn and Digit to do this for you, but good old fashioned manual depositing via your investment app (Betterment, Vanguard, Personal Capital, or any others) all make it super easy to deposit. I find that doing it manually is A LOT more fun and will get you motivated to escalate your limits. Next you need a really good investing strategy to help you $50 a day grow. Here’s the 7 step early retirement investing strategy that I used. This is the most important rule in investing – don’t invest in anything you don’t understand. Don’t just put your money in investments that your friends or family or a financial advisor or someone you just met told you to invest in, without understanding exactly what the invest is and what the risk/reward tradeoff is. Invest in what you know – read and understand your options. While it may seem tough at first, it doesn’t take long before you start to see the difference between good investment opportunities and crappy ones. I was recently at a money summit where participants were being taught how to invest in real estate, but the seminar also had speakers who were selling very risky investments. I watched at a guy talk on stage to over 2,000 people clearly didn’t know much about investing, about how profitable investing in tax liens can be. After he was done, literally 90% of the room got up and ran to a booth to buy his software and tax lien subscription service for like $1,000. While I am sure there are people out there who make money investing in tax liens, it’s a type of investment only professionals use to make money. While the concept is simple, it takes a lot of time, expertise, and experience to actually execute it successfully. I can guarantee that many of the investors were hearing about tax liens for the first time, yet 90% of them invested in them right on the spot! If you don’t understand it, then don’t invest in it. Another tip: Before you buy any investment always wait at least one week to invest in it. Sleep on it. Read more about it. Never invest in anything on the spot no matter how good it sounds. If any investment is being sold as a “once in a lifetime opportunity” or sounds too good to be true than it probably is. No matter how much you trust your friends or family who are making an investment recommendation, don’t invest without doing your own research. Not all investments are equal. While you can invest in art, wine, commodities, currencies, cryptocurrencies, domains, furniture, collectibles, businesses and tons of other things, they can be risky. As I’m writing this post there is a global cryptocurrency investing craze. The value of Bitcoin, Litecoin, Ethereum, and other cryptocurrencies have increased over 3000% this year. Sure, you could potentially find the next Andy Warhol or invest in the next BitCoin, and that might be all you need to retire early, but it will likely be based on luck. And while luck is nice, you can’t count on it. If you use sound investing rules/principles, investing in stocks (which are shares of actual companies), bonds (money that you are loaning someone), and real estate are the easiest most dependable investments that can make you a lot of money. I’m not saying you can’t invest in other things, just that you should only invest up to 5% of your entire investment portfolio in what are known as “alternative investments,” which are anything other than stocks. Here’s why stock, bonds, and real estate are the best investments to retire early. These three form the foundation for the early retirement investment strategy. When you buy stock, you are buying a share of a real company. You literally own a small part of the company. As the company makes money, creates more value, or as people believe it will go up in value, the price of the stock can go up. The more demand for the stock and the more people believe in it, the higher the price can go. It can also go down if the opposite is true and demand for the stock goes down. Stocks are traded all over the world on many different exchanges (which are basically networks or stocks). The two largest stock exchanges in the United States are the New York Stock Exchange, which was founded in 1817 and is actually the largest exchange in the world, and NASDAQ, which was founded in 1971. There are winners and there are losers, and the stock market has minted countless millionaires and even billionaires – many whom have made more money investing in stock than they ever could have made any other way. The stock market will make you a millionaire in your sleep. You can buy individual stocks or groups of stocks. Individual stocks can swing wildly in value over both short and long periods of time, so I don’t recommend you put more than 10% of your investments in individual stocks. If you would have bought $5,000 in Amazon stock in 1997, it would be worth at least $2.5 million as of this writing. Amazon have gone from $18 a share to over $1,100 as of this writing. But since you are investing in business when you buy stock, there is always the chance that the business could go out of business and you lose all of your money. Enron, an energy trading company’s shares went from a high of $90.56 in the year 2000 to a low of $0.67 in January 2002. Stock holders ended up losing $74 billion. The entire stock market can also swing wildly. For example, on October 19, 1987 the US stock market dropped 22.61% (the biggest percentage daily loss) and on March 15, 1933 the stock market was up 15.34% (the biggest daily gain). But while those are massive swings and there is certainly risk in investing with stocks, as the country grows, wealth grows, and the value of companies continues to grow. Over the past 100 years the entire United States stock market has grown an average of 7.3% per year. 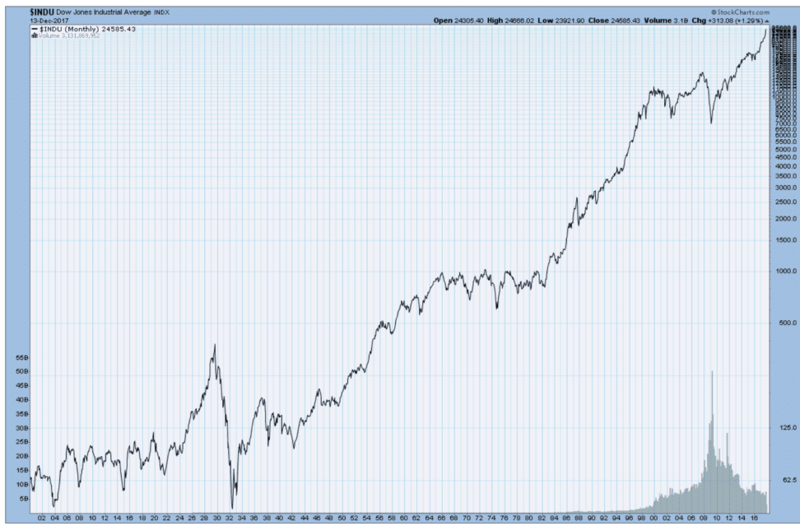 You can see the daily ups and downs in the stock market in the chart below, but the trend has always been up over time. It’s never wise to have your entire portfolio in any individual stocks because you don’t want to lose a ton of money if the value of the individual stock drops or all of your money disappearing if a company goes out of business. This is why I recommend putting a majority of your long-term investments in the entire US stock market. The longer you invest, the more your money can compound and grow. A bond is a form of debt issued when a company, government, or municipality needs money. When you buy the bond you are loaning money to whoever issued it for a certain period of time at a fixed interest rate. Because the interest rate is fixed (meaning it’s set by the bond issuer), bonds are known as fixed income investments, so you can count on the returns as long as the issuer doesn’t default on the loan. Bonds can be bought and sold just like stocks and the price of a bond, like stocks, is based on supply and demand. But bonds are traditionally viewed as less risky investments than stocks, but this also means that interest, since it’s fixed, will also be less than stocks. However, some bond investment are riskier than others and in some cases even more risky than stocks. Bonds are rated depending on the level of risk a company has of potentially default on their loan. The ratings are based on a company’s credit worthiness. The lower the rating, the higher the risk, typically the higher the fixed interest rate. The two most popular Bond rating agencies are Moody’s and Standard & Poor’s. Here is their rating system. I only recommend investing in investment grade bonds, any bond below are called “junk bonds” for a reason. However you’ll likely never need to buy bonds directly since both the transaction fees can be costly and just like you shouldn’t put much of your money in individual stocks because there is too much risk putting your money into one investment. It’s a lot easier to buy bonds in what are known as mutual funds or ETFs, which hold a collection of bonds – organize by rating or type, or some other criteria, which will help you diversify your risk. You can also easily buy municipal, government, and corporate bond mutual funds and ETFs online. Investing in real estate can help you retire early. You can literally reach early retirement decades earlier because real estate can generate consistent cash flow (so you need to withdrawal less money from your portfolio) and you have an asset the will continue to grow. Real estate is also unique because you don’t need much money to get into it. In fact, you can actually use mostly other people’s money (bank mortgages) to start building a real estate portfolio or even a real estate empire. You can also pretty easily invest in real estate while working full time and having a side hustle. In fact, I have a few friends, who are on track to reach early retirement just through real estate alone. One of them has even quit his full-time job to do it full-time. Real estate investing is so effective that I’ve written an entire chapter dedicated to it later in the book, but here’s an introduction to real estate investing, which in addition to stocks and bonds, makes up most of my own investing portfolio. With any real estate investment, you are hoping to make money when the value of a property goes up. The value is based, like any other investment, on supply and demand. The higher the demand and lower the supply, the higher the value. While all there of the primary ways to invest in real estate can make you money, I am going to focus on number 3, since I think owning tangible properties is the best and most profitable way to invest in real estate. When you actually own a property, you can do amazing things with it and real estate is amazing because it’s the only investment that you can actually live in. When you buy your first property you will owe a lot of money on it if you are taking out a mortgage from a bank (which you should definitely do). As you pay down the mortgage and property appreciates (goes up in value) your equity (the percentage of the property you own) grows. But you don’t have to pay the mortgage yourself, you can get renters in the property to cover it by house hacking. While your renters might barely cover the cost of the mortgage at first, over time as the property gets more valuable, you can increase rent and start putting the extra money you get after the mortgage is paid in your pocket (or even better you can invest it stocks, bonds, or other properties!). There are many real estate investors who get enough money from their rental properties to cover the mortgages, their monthly living expenses, and have more left over to keep investing. Over time you should get more and more cash flow from your properties, the value of the property will continue to appreciate, and your ownership percentage will also grow. Eventually you can even pay off the mortgage and then all of the rent money will be yours and you will have an asset that will hopefully continue to go up in value. Then you can sell it to recoup the value and invest the money another way, or keep the rental cash flow for life. This is why you can and should include real estate income in your early retirement calculations. Because if you have properties that are generating consistent cash flow (and can for life!) then you actually need less money saved to retire early. You can also factor in property values into your net-worth because they are assets and they can go up in value. It’s incredible. How would you feel if you lost $5,000 today? What about if you made $5,000? The psychological concept of “loss aversion,” highlights that people feel 2x as worse losing money than they do feeling good making money. We all hate to lose. But with any investment you can make or lose money. How much money you can make (or lose) depends on how much risk you are willing to take. Generally, the riskier the investment, the more money you can make or lose. In some cases, you could not only lose all of your money, you could lose even more than you put in (aka short selling! ), which I definitely don’t recommend. When I was just starting out investing just after college I took $3,000 and decided I was going turn it into a million dollars by day trading, so I spent almost an entire day researching stocks doing Google searches like “best stock picks” and “undervalued stocks”. I’m a smart guy I thought, I can figure out this investing game. I eventually found a stock that I thought was perfect – it was a small manufacturing company that one article said “was the stock pick of a lifetime.” To this day I can’t even remember the company, but I do remember my palms getting sweaty as I pushed the button online as I put almost all of my money into this one stock that I had just found. It turned out to be a terrible idea. I ended up losing about $1,700 in one day, freaked out and sold the $1,300 left of the stock that I had bought less than 24 hours before. I was an emotional wreck that day and for the next couple weeks as I took stock of the fact that pretty much more than half of my net-worth had disappeared in a single day. Stay away from day trading. Yes, there is always a story of someone who completely crushed the stock market and made millions of dollars in one day picking the right stock – but that is unlikely to be you. The odds just aren’t in your favor – a vast majority of day traders lose money. Don’t take the risk. When I tried day trading stocks I was looking for a huge immediate return today – but that is not how you reach early retirement, since you won’t be able to sustain growth every day. Most people invest for the short term and try to grow their money as quickly as possible – but this is why they end up losing. One way to control risk is by investing in a collection of stocks and bonds known as mutual funds and ETFs (exchange traded funds). You can buy a single stock or bond, or you can invest in stocks and bonds through mutual funds or ETFs. Mutual funds and ETFs hold a collection of stocks, bonds, a mixture of stocks and bonds, or in some cases mutual funds or ETFs hold a collection of other funds. Funds are built around sectors (real estate, transportation, tech etc. ), investment risk (stable, aggressive, etc.) ones that hold share of almost all stocks (total market funds), international/domestic funds, target date funds (where risk is adjusted based on how close you are to needing the money/want to retire), and balanced funds (which hold stock and bonds based on a particular asset allocation – ex. 60% stocks/40% bonds). Mutual funds and ETFs are either managed actively (meaning a team actively buys and sells the stocks and bonds within the fund) or passively (there is very little to no buying or selling). Another popular name for passive funds are index funds, which track a group of stocks or bonds, or even in some cases all stocks and bonds. Mutual funds and ETFs are very similar, but mutual funds are only priced once a day, and ETFs behave like stocks and the value can fluctuate throughout the day. Fees are often similar, but ETF can be a bit cheaper, although come with transaction costs, which might negate the benefits of the cheaper management fee. Big tip: Only buy what are called “no load” mutual funds or ETFs, meaning whoever you are buying them from aren’t charging you a percentage or the performance or large fees to hold them. You’d be surprised (or probably not) that there are companies out there who charge really high fees for doing pretty much nothing. Only buy “no load” funds. One of the benefits of investing in mutual funds and ETFs is the ability to get diversification, which is a valuable investing strategy, because it can distribute the risk of your investments across a number of different assets, so if type of asset it down is down, others might be up. But no matter whether you invest in a stock or a bond directly, or through a mutual fund or ETF (exchange traded fund), it needs to be held within an investment account. Many 401k, 403b, 457, and HSA accounts have restrictions on what you can buy invest inside them – for all of them you can’t invest in stocks or bonds directly, but you can invest in mutual funds and ETFs. Just because I thought it would be cool, here’s a risk investing scale I built. 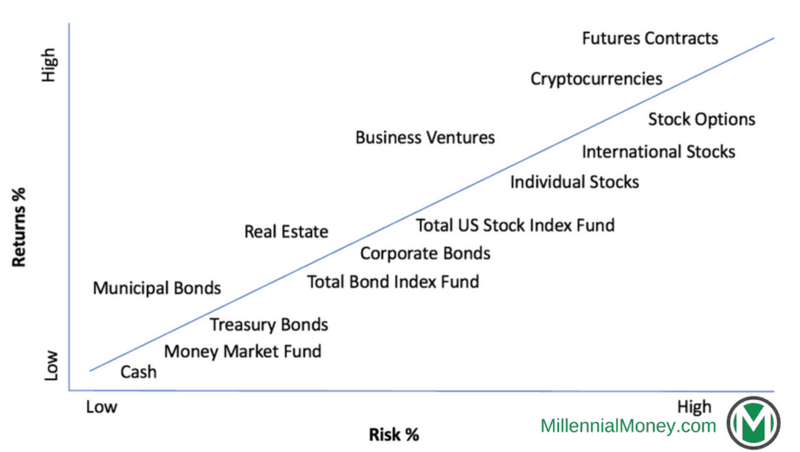 While risk can vary substantially by investment type, this should give you a good idea of where investment risk falls. The risk of early retirement is determined by the types of investments you hold and how much you hold of them. Diversification is important – you never want to have all of your money in one investment, no matter how amazing you think it is. You want to spread out your money across different types of investments to distribute and mitigate risk. Typically, this is done by investing in stocks and bonds, because when stocks are down bonds typically go up, and vice versa. You can also invest in cash of course, which you can hold in accounts that will match inflation so you don’t lose money. Historically stocks are riskier investments than bonds, so the more stocks you hold in your portfolio the risker it is – meaning the more it could do down, but also the more it could go up. So having a portfolio invested 100% in stocks is riskier than having a portfolio invested 60% in stocks and 40% in bonds or 40% in stocks and 60% in bonds. If the stock market goes down, the more you have invested in bonds, the less your portfolio will likely go down, but the more you have invested in bonds when the stock market goes up, the less it will go up. While typical advice is to invest your age in bonds and the rest in stocks, this was too conservative of an approach for me personally. You should do what you feel comfortable with and how long you anticipate it taking you to hit your early retirement goal. The longer you have until early retirement, the higher your percentage should be in stock. 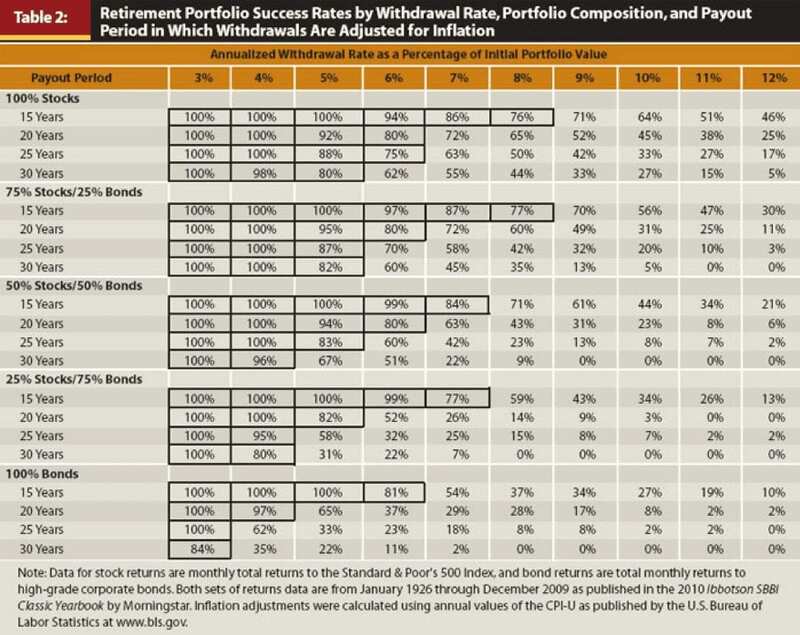 When you are ready to retire early, the Trinity Study estimates your level of success based on the percentage allocation you have in stock and bonds, but this again, should be customized based on how much you plan to withdrawal over the first 5-10 years of walking away. The less money you need and the more years you have to stay retired, I’d recommend the more you keep in stocks. Now want to introduce you to one of my favorite investing ideas – the efficient frontier. The simple idea is that the closer your portfolio is to the efficient frontier the higher the potential that you will get the best returns with the lowest amount of risk. You want to balance your risk with your reward. If you are 10+ years away from early retirement then I recommend you invest 100% in equities for now and then depending on how well the market is performing and you anticipate it to perform as you approach retiring early, then you should re-evaluate. Investing for early retirement is about balancing short term and long-term investing. The better your investments do in the short term and long term also determines how quickly you can retire early (and keep work optional forever). It’s about balancing risk and adjust your investments based on your short and long-term priorities. Let’s say you want to buy a house in the next few years, or redo your kitchen, or take that amazing vacation. If you are going to need your money in the next 5 years or less then you should invest in assets that are less risky. While your investments won’t grow as much as they could, they also won’t lose as much money – you don’t want your money to be down 20% right before you need it. Most people hold their short-term investments in cash in savings account, so they can access the money immediately. This is an okay option if it helps you sleep at night, but most savings accounts grow at less than 1% per year, so you will actually be losing money to inflation (which grows 2-3% per year) leaving your cash in a savings account. I personally think that a lot of people sit on too much cash, but that’s a personal decision and for a lot of people, it helps them sleep at night. I sleep better knowing my money is making money, and even if I lose money in the short term, over time I will come out way ahead. Another option, is to put your money in a CD (certificate of deposit), where you lock your money in for a fixed period of time for a guaranteed rate, which might get you closer to 2%. But CDs force you to lock up your money for a period of time and you’ll get penalized if you take the money out early, so you don’t get the flexibility of cash if you need the money in a pinch. But I think a better option is keeping your money in a Bond fund like the Vanguard Total Bond Market Index Fund, so you can at least keep up with inflation (and potentially beat it). Over the last 5 years it’s returned approximately 2% each year. Or if you want to take a little more risk, you could invest in a balanced index fund like the Vanguard Wellesley Income fund, which invests in approximately 60% bonds and 40% stocks, so you can generate a higher return (with slightly higher risk). Over the past 5 and 10 years, the Wellesley has returned 6.82% per year. That sure beats the 0.1% most savings accounts offer. Even if you need your money in the next 5 years don’t keep it on the sidelines. No matter when you start investing, a majority of your money should be invested for the long term (30+ years). The name of the game is buy and hold. It’s set it and forget it money. It’s the money that is going to work the hardest for you. Unfortunately, many investors don’t think about the long term –try to get the highest return possible today, instead of focusing on the long game. When their accounts are down they freak out and sell. Sometimes your investments are going to be down and sometimes they’re going to be up. But over the long haul the stock market always keeps growing, so the longer you keep your money invested the bigger it will get. Don’t freak out and sell. Try to never take out your long-term investments and keep adding as much money as you can to them as frequently as possible. The earlier you start and the more frequently you invest the more money you will have. No amount is too small to make an impact. Every cent counts and will speed up the growth and compounding of your money. While I will get into more detail in the next chapter with different target allocation percentages, about 10% of my long-term investments are in a few individual stocks that I plan to hold forever (Amazon stock for example), 10% is in real estate, and the other 80% is in the Vanguard Total Stock Market Index Fund admiral shares, which has a very low fee of 0.04%, is a no load fun (so I don’t pay any commissions), it’s high tax efficiency (because very few stocks are bought and sold), and it’s highly diversified (it invests in almost every stock in the US stock market!). Over the past 10 years the annual rate of compounding has been 7.69%, which is just above target for the expected performance of the total stock market. I started investing in it in 2010 and have never taken any money out. 2) and when you take the money out. Early retirement tax optimization will make a difference in having not only more money to live on today, but also more money to invest so it can grow larger, and more money when you withdrawal the money in the future. The lower you can keep your tax rate the better – the less taxes you will pay when you invest the money and the less you will pay when it comes out. This doesn’t mean you shouldn’t pay your taxes – it means that you should use the tax law to your advantage and pay what you actually owe. Many people pay a lot more in taxes than they should be paying (maybe that’s one of the reason’s the government makes the tax code so long and confusing?). First, you should optimize the money you are putting into your accounts by using the right accounts the right way for early retirement. For example, you should invest in your tax advantaged accounts first and put as much money into them as you can, so you minimize the amount of your income. There are many types of investment accounts, some designed for retirement planning offered by an employer and others for individual investors. Stock and bond investments are held within either tax deferred accounts (when you contribute the money before you pay taxes on it) or in after tax brokerage accounts. Investment accounts are typically easy to set up and offered by many companies, but some companies charge much higher fees than others when you buy or sell investments, or simply to hold them. These fees, as you’ll see below can cost you a lot of money over time, so you want to keep them as low as possible. While many employers offer some form of a retirement account, there are often restrictions on what you can invest within them and funds are limited by those that your employer and the company managing them offer. So for example, you can’t buy individual stocks within a 401k account offered by your company, but can in your own IRA or brokerage accounts. There are also restrictions on which accounts types of accounts you can concurrently have and contribute to in each year, as well as how much money you can contribute (this can change every year and usually goes up, so check each year to see the maximum you can contribute). Next, you should also take as many tax deductions as you can. Justin who retired in his thirties in 2013 is a master of minimizing his taxes. Before he retired he and his wife were making a combined $150,000 per year, but through deductions (and a close reading of the tax code), they were able to reduce their taxes all the way down to $150! 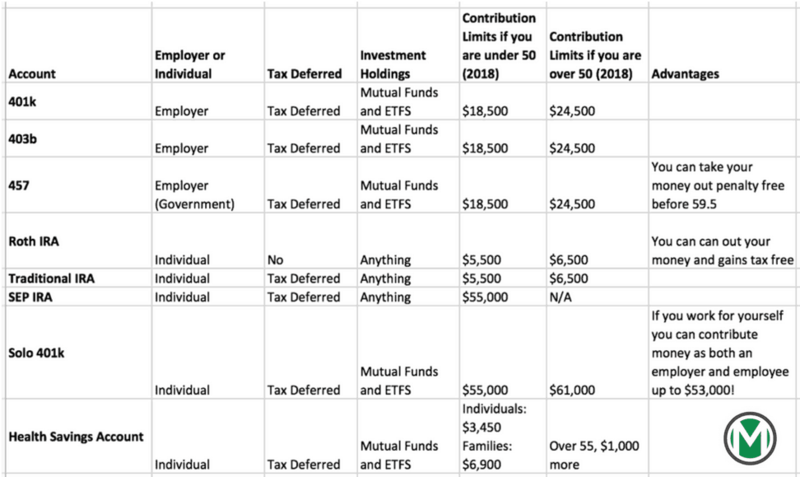 So they paid 0.1% of their income in taxes by maximizing their contributions to their tax advantaged accounts and take the appropriate deductions for having 3 kids, as well as many other deductions. And if you have any side hustles or have a business you can deduct a ton of expenses as long as they are related to your business. Since the tax code is always changing it’s something you might want to learn or work with a friend to help you out. This is also one area where it can really pay off to work with an expert tax accountant on a pay per hour basis. Experienced early retirement tax accountants can help you save a ton of money each year. Over time you will start to learn the best deductions to take based on your life situation and might be able to do all of your taxes yourself. The less you can pay in taxes going in, the more you can invest. All that additional money Justin and his family saved he was able to invest to help them retire early. Now let’s think about the taxes you will have to pay when withdrawing the money to cover your monthly expenses. Since you putting money into your tax advantaged accounts and not paying tax on the money going in, you will need to pay money when you take it out. How you are taxed on your withdrawals differs between your tax deferred/tax advantaged accounts and your taxable accounts. Your investment gains and principal in any Roth accounts (Roth IRA or Roth 401k) are not taxable! Your investment in tax deferred accounts (401k, 403b, 457, Traditional IRA) are tax based on your income tax bracket when you withdrawal the money. Income tax levels in the United States as of this writing are between 10%-39.60%. Your investments in taxable accounts (brokerage) and qualified dividends are taxed at the capital gains rate (as long as you’ve held the investment for over 1 year). Currently the capital gains tax rate is between 0-20% depending on your income tax bracket. Keep yourself in the lowest tax bracket possible! This is why in the future you will want to try to be in the lowest tax bracket as possible. Being in the 10% bracket vs. the 15%, makes you money go 5% farther. While we don’t know what the tax brackets, capital gains laws, or tax policy will look like in the future, keep this in mind as you save. The less income after deductions, the less taxes you will pay. Fees, just like taxes can have a massive impact on how much your investments can grow and how quickly you can retire early. The dude sitting across from me is totally sizing me up. Seth first looks at my shoes when I walk into his office, and then when I sit down I can see his eyes follow the hem of my suit jacket and him catch a quick glimpse of my watch. He’s trying to get my vibe, but more simply he’s trying to assess, based on my clothes and appearance, how much money I have. He’s totally confused. It’s easy to see in his face. For a 10 am meeting at a big bank branch downtown, I look a little disheveled. I’m wearing a nice sport coat, but my black V neck t-shirt, is one of the ones I wear every day and is from an older batch that I bought last fall – so the black is faded and the neck is a little loose and there’s a tiny hole that visible if you look closely enough. My long hair is a mess, spilling out of my hair tie on the top of my head. I’m also wearing ratty old white Adidas shoes that aren’t very white anymore, but I’m also wearing a nice vintage watch, which if he knows anything about watches, isn’t vibing with the rest of my appearance. I’m here on a secret mission to figure out what this private wealth manager at one of the biggest banks in the world, thinks that I should do with my money. You see I’ve recently become a millennial millionaire, and while I’ve never worked with a financial advisor or wealth manager, I’m trying to figure out if they know something I don’t and have any ideas I can learn from to implement myself. Seth could be a carbon copy of the other wealth managers I’ve chatted with. He’s about 40, but still rocking that banker blue shirt and slicked back hair. It’s the fifth meeting like this I’ve had in a few months and it’s always pretty much the same scene and the same vibe. The firm handshake, the big smile, the laughter, some bro asking me how my weekend was if it’s Monday or Tuesday, or what I’ve got planned for the weekend if it’s Thursday or Friday. After opening my investment accounts to Seth he starts getting excited and immediately tries to sell me on investing in two actively managed funds (that he said “can totally beat the market”) and that I should also start putting some of the money into an annuity to guarantee my cash. All of the options he mentions have high fees (between 2-4%) and when I push him it’s hard for him to defend his decisions. “Trust me,” he said, I do this for a living, gesturing his hand around his large office. Many people might take Seth’s advice for face value, but he’s a banker, and in the business of making money off other people’s money. I’m not hating on bankers, or money managers, or advisors. But their businesses aren’t built to help you reach early retirement as quickly as possible. Any company that holds or manages your early retirement investments are going to charge a fee to do so. Whenever you are investing there are typically multiple layers of fees, for example if you invest in your company’s 401k plan you pay a fee to the company that manages the 401k and you also pay a fee to each company that manages the investment vehicles inside the 401k. And that’s just your 401k, you will have fees for all of your investments and investment accounts. And these fees actually have a big impact on how fast your money grows, how much money you’ll have in 5, 10, 20+ years, and impact how many years it will take to retire early. Here’s why: Fees limit the amount of money that is compounding. While 0.5%-1% of your investments or $100 a month might seem small to you, it’s not because the more money you take out from the compounding equation the slower it will grow, the less you’ll have, and the longer it will take to walk away. Every 0.1% in fees will keep you working longer to hit your walk away number. Fees also have a bigger impact the younger you are, since your investments (and the impact of the fees) have longer to compound over time. Even if you don’t have millions of dollars to invest for early retirement, a small difference in fees will add up to hundreds of thousands of dollars by the time you reach early retirement. Fees also matter once you retire early, because if you are living off 3-4% of your investment gains and your investments are growing an average of 7% per year, then taking out another 1% for fees, means you will only be able to keep 2%-3% of the investment gains in the market compounding. If you have investment accounts, I encourage you to open up your accounts and check your fees right now. For investment accounts note the percentage you are being charged to have your investments managed, as well as any additional administrative fees. Always check the layers of fees and what you are being charged by the company that is holding your investments (brokerage), the company who is managing your investment (ex. mutual fund company), and if you work with a financial manager you will be charged by them too to “manage your money”. List all of your investment accounts. In the account column list where the investment is held, in the investment column list the investment, in the company fee column list the annual fee the company charges (if any) to manage the investment, the investment fee or expense ratio list what % of the investment is charged by the company who manages the investment, and any fees for a financial advisor if you have one. Here’s a hypothetical snapshot of someone’s investments and their fees to show you what your charges could look like. Investing fees really add up! Remember over time even a small difference in fees like .3%-1% can really make a massive difference in your investment returns over a long period and the time it will take you to hit your early retirement goal. Any fee over 0.30% should be re-evaluated, since there are likely more affordable, but similar, investment options you could choose. In some cases, like with your 401k, the fees are determined based on the company your employer chooses to administer the 401k, so you likely won’t be able to reduce them. But if the fees are high, definitely talk to the human resources department at your company to see what they can do. If you do decide to work with or consult a financial advisor, I recommend fee only advisors, since you can pay them by hour. I strongly recommend against paying anyone based on your AUM (assets under management) since the fees will cut into your investment growth and the fees will only go up as your investments grow. Since it’s so important, I’m going to mention it again – only buy “no load” funds and read the fine print about fees and costs. While it’s kind of a pain sometimes to dig for these fees, it’s more than worth your time – trust me. It will have an impact on when you when you reach early retirement. Investing consistently is essential. The more you do it, the more money you’ll make. Keep at it. While your early retirement goal might feel massive and unattainable right now, the only way to get there is to take it one day at a time and to just get started. If your sitting on the sidelines because you are afraid you don’t know enough about investing, don’t wait. Getting started early is more important than waiting and making the perfect investment. And if you are sitting on the sidelines waiting to “time the market,” it’s not possible. I can’t do it. Experts can’t do it. The longer you wait, the more time you are wasting – every day of compounding matters. Start today. Seriously, you don’t need to figure out everything before you start investing. You’ll learn quickly and will figure it out as you go. You are going to make mistakes. I did. We all do. You’ll learn from them. An easy way to get started is through automation. Automate as much of your investing life as you can, but also use daily or weekly check-ins to invest as much as you can. It’s pretty easy to automate your investments. Most companies who manage 401k, IRA, and other investment accounts make it easy to set up automated investments – so you can buy shares of mutual funds, ETFs, stocks, and bonds automatically on a set schedule. But automation is not enough to reach early retirement. 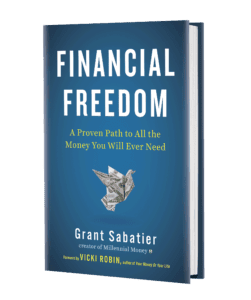 As we’ve already discussed when you automate your finances, because you are saving consistently, you might feel like you are saving enough, but you aren’t saving as much as you can. Saving enough and as much as you can are very different. 2) and also manually invest all additional money you make from side hustling and bonuses as quickly as you can. So your 401k might be automated to contribute 10% of your salary with each paycheck. That 10% will be contributed without you doing anything. But then I recommend you go in and increase that contribution rate as high as you can to keep pushing it. Try to increase your savings rate it at least 1% every 30-90 days. Or more, as much as you can. Some months it will be easier than others. Push yourself. It’s this manual pushing that will help you save as much as possible. When you get a raise or bonus, invest as much of it as you can. When you make $60 watching your neighbor’s cat, invest it. It will take you a few minutes and you can do it from your phone. Keep at it! You can definitely retire early. The more you invest every day, the faster you will retire early. If it means that much to you, you’ll make time for it. Every $10 you invest today, could help you reach early retirement days, weeks, or maybe even months sooner in the future. Imagine how much time making that extra investment is buying you in future time. Now that you’ve learned how to retire early, you need to pay attention to the mechanics and make decisions that minimize taxes, minimize fees, and invest consistently in the right accounts the right way, so you can reach early retirement as quickly as possible. 1% Early Retirement Strategy [Calculator] When Can You Retire? (Early Retirement Calculator) The History of Early Retirement Will Millennials be able to retire? Simple but such a great hack, thanks for sharing! I know how awesome it feels when my automated transfer shows up in my investment account once a month – I can totally see how it would be so much more rewarding to do it manually and daily (addictive, in a good way!). Thanks Kate. This one hack changed my life. I hope it helps others do the same! Awesome hack but did you have a daily cash flow? I am trying to transfer money every week since I get pay every week, but I don’t really see what difference it can do to transfer this amount on a daily basis. Good question. Yes as my side hustles picked up I started having more frequent cash flow. It’s also more of a mindset, where the daily deposits have made a bigger impact than weekly ones. I tried weekly and would forget, or put it off if I had a big expense. Doing it daily really got me excited and focused on my finances. So for example even when I got a bi-weekly check instead of depositing it at that time, I would wait and put it in at $50 a day so I knew I was sticking to my plan. When there was extra I would deposit extra. Some days If I only have $60 for that day, I’d forgo going out so I could put the $50 in. For me it’s mindset and daily repetition that works best. Hope this helps. Thanks TFT. Thanks Peter. It sounds like you have a system that works for you – which is most important. This is just the system that worked best for me and really help bring the idea of “saving enough for retirement” down to earth for me. I couldn’t grasp the huge numbers and I know this trips a lot of people up. It’s just too daunting. But $50 a day seemed doable for me and when I really started maximizing it every day, my investing account really started to build a lot faster than I expected. Where are you located? I usually just try to save a percentage of my income. However, this seems like it could be a really motivating way to save. Thanks for sharing! Thanks Graham. It’s definitely worth testing a few ways. It was always easier and more effective for me to think about hitting a daily savings goal. The daily habit was/is huge for me. But taking the same idea I could also save $350 per week or $1,400 a month and still get there. BUT…… when I do it every day I always try and deposit more. When I tried to do it each week I would be like boom, $350 deposit done! Doing the deposit every day really helps me push it. So some days I was putting in $100 or more – then looking back at the end of the month I would have put in $2,600 instead of just the $1,400 if I just deposited monthly. That’s key for me. Love this hack! It’s a great way to break down what seems like an impossible goal, like a million dollars in savings, and see it as achievable through small daily steps. It’s certainly worth a try if you’re finding it difficult to put away money towards long-term goals or financial independence – start with just a few dollars a day and work your way up. Thanks! I agree. I think a lot of people will need a lot less money than they think. But better safe than sorry right. $50K a year is a lot of money most places today, but who knows what $50K can buy in 30 years. Great way to break the goals down into daily chunks in a way that makes the goals not just comprehensible, but also manageable for most people. I think everyone who lives moderately comfortable today could probably find a way to finance those $50 per day, either by reducing expenses or by hustling on the side. Great hack! I love this approach of viewing it on a daily schedule. Weekly or monthly can be easy to forget! Thanks Matt. A Grant a day makes retirement possible! This is great! I usually look at what I can do monthly versus daily… I guess with some minor tweaks I could start upping that! When you start turning it into a game and get serious about playing, this can really add up! Try it! It’s a lot of fun. Thanks Steven. I like the idea of it being a game and competing with yourself. I’ve been selling stuff on eBay and I transfer money everyday from my PayPal account into my savings account. I think it’s very motivating to see the progress and growing balances. Nice Frugal Prof. It’s definitely super motivating transferring money daily. I’m happy to hear you’ve been saving your eBay side hustle money. Great call! Hey, any strategy that helps us reach savings goals is a good strategy! I’m all for it, thanks for sharing. Nice! I’ve met 11 Grants in my life. Most of them were under 10 years old. Maybe it’s getting more popular? My Mom picked it because she didn’t want me to have a nickname. Now she calls me Millennial Money – lol. j/k. Thanks for the kind words Julie. Thanks Jen. Best of luck! Let me know how it goes. I love the concept of breaking down goals to make them more achievable. When I first read I’d need to save $1 million to retire I looked at my bank balance and thought ‘this is never going to happen.’ By breaking it down it didn’t feel so overwhelming. Seeing that my current savings rate it will take me 33 years to reach my goal has also been a motivator to increase my income and I’ve been working on that for a little while now. + 1 as well for manually transferring money. It’s fortnightly for me in line with my pay periods, however it is really motivating to actually see the money moving. Thanks Miss Balance. I was overwhelmed too and saving daily helped make it more manageable, and accessible to me. My 29 year old son and I both read this post. Mind. Blown. Scott Lara, Jax Fl. Great idea! We as humans work best when we break the task at hand down to the smallest measurable task. This is a perfect example of that. Thanks for sharing! I think that’s a great way to save. Personally, I can’t do it everyday, but I’m glad it works for you. It’s just easier for me to do it once per month or something like that. You gotta take it one day at a time. Thanks Jow. Whatever works – as long as the saving happens. I personally always made excuses when I pushed it to the end of the month. This is a great concept to build a habit and achieve large goals. Another way to look at contributions… some plans focus on auto increasing annually. Say your target is 15% and you’re at 10%. Instead of doing a full percent increase each year break it down monthly. 1/12% increase each month. This takes the sting away while you ramp up to your goal. I currently have a Roth IRA at Vanguard, with I max out yearly. You have motivated me to start the $50 daily strategy! What type of investment account did you deposit your $50 into at Vanguard? Do I pick the investments within this account? Thanks. This sounds like a great idea, and I’m sure it is to save daily. However, not many people can reach that same amount, without a tremendous “side hustle”. Most of us 9 to 5’er’s don’t have time for a side hustle or one that pays so hugely. What is your side hustle? This is a great tip using human nature. Thank you. I am a complete novice at financing and investing. My biggest question is what kind of investment account do you use? like a mutual fund? Thanks Dana. Yes an investment can always lose money, but the stock market has historically always gone up over any 10 year period. But I always think about investing for the long term, so your personal circumstances may be different. When you think about investing long term, the key is to invest as much as you can as frequently as you can (Google search dollar cost averaging). I invest mostly in low-cost index funds through Vanguard. You can learn more about my investing strategies by clicking here and here. What were some of your side hustles? For millennials, pumping out $18,250 per year (equivalent of $50.00 per day) in after tax dollars would be quite an achievement given the costs of student loans, housing expenses, and living costs that compete for the paycheck. In Buffalo, NY….a single income earner making a gross salary of $40,000 would expect to have around $31,300 after taxes. Less $50.00 per day…that leaves $13,050 for all of life’s living expenses! What was your strategy for building up your salary in order to be able to hit your $50.00 per day goal? These ar all great questions Michael. I started at $5 per day and then tried to quickly escalate my savings rate. I did this through side hustling and making money any way I could – even if it was just for small amounts of money, every day I thought about how I could save more money that day. To your point it’s hard to save that much making $40,000, but I hear from readers who do and save at least 50% of their income – it either comes down to choices and sacrifices at that salary level, or making more money by getting a raise or side hustling. Where did the $1.2MM figure come from? Just curious if this is for a single person and if I would need to multiply by 2 if married. Thanks! Great article! I came from me multiplying my expected annual expenses of $50,000 x 25 (which is a baseline calculation of money needed to retire). Annual expenses x 25. Would this concept be different for someone in Canada? Would someone in Canada use a different app? Hi Jessa. I don’t know much about Canada, but the concept of daily saving definitely still applies. You can use whatever investing app you feel comfortable with – the key is to stick with it! I am 47 we only make 18 000$ a year so…”only” saving 18 000$ a year? Hi Julie. Start small and increase savings when you can. I started at $5 per day. i read this article of yours a while ago and it was pure inspiration&motivation for me. – TX – Breaking down the numbers to the daily amount made it seem a lot easier to realize. I cut costs at all corners and reached 50$ a day this year. YESSSSSS! This is great to here. Keep me posted on how the $50 a day strategy goes this year! I did exactly this a few years ago. I knew I was going to retire early and wanted to make a final push to pad my overall assets and net worth. So I identified $100 per day for as many days in a row as I could. This was in addition to what I was already saving normally. So it was like finding new ways to save or generate savings. The best were recurring fees that I was able to reduce (like optimizing insurance and cancelling cable), but I also just sold stuff that I didn’t need anymore (like an old snowboard that was actually a collectors item). In two weeks, I managed to unlock $2,800 in pretty low hanging fruit–which worked out to well over $100 per day. I think this approach is so much better than trying to budget. Thanks Tom! I’m all about that low-hanging fruit. I read that you had 7 income streams from side hustles. What type of side hustles did you have producing those revenue streams? love the blog and the super short podcast tips, learning so much! Quick question, you say you deposit money into your investment account daily but do you invest that money daily? I would think this would incur a large amount of transaction fees from the broker (in your case vanguard)?! If you don’t invest it daily, do you have a certain threshold before you invest it? Very nice strategy to motivate anyone to save. I started off years ago doing 3-5% and am now doing many times that. I had to work my way though. I think just about any goal is attainable, if you want it bad enough. An insightful post. While I can’t afford to save $50/day, I have implemented the strategy starting where I am and with what I have. My goal is to scale up accordingly. I hope that one day I too can save $20k/day! That is just insane! Mr. Money Moustache says invest in vanguard with Vanguard Total Stock Market Index Fund. It requires a minimum of 3,000 to get started. Do you just save 3K and then start investing? Or is there something that a poor graduate student can start investing in that is just as good? You can start with a Total Stock Market ETF that has no minimum. Great post sir! $50 a day is a great way to start. Or sometimes just save a cup of coffee a day could make a big difference. Thanks for writing! I started with $5 a day back in college. When all my friends were getting an extra drink at last call, I had water and started investing in myself. Now I am up to $87 daily savings. It’s important for young adults to find their inner money mindset. Or else, the millennial generation is going to be poorer than our parents. Keep spreading words of encouragement Grant! Great post by you about early retirement strategy. I’m 35 years old and now engaged in a job. Your strategy helps me to learn more about early plans of retirement. You write a wonderful post for me about early retirement strategy. 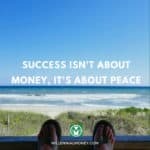 It can help to evaluate my earlier spending and how much I have to invest monthly to reach that point of financial freedom. I have also used your calculator It working wisely. This is a great post and has motivated me and others to try this strategy. I am confused on how to start. I have a 401K but only contribute a small amount so that I have enough cash each month to pay the bills etc..I rather look at my savings each day or week and then invest a certain amount to a fund. But can I also invest in a Roth, since I don’t know if I am eligible because of my combined income with my wife. Or is there a good taxable account I could start maybe. Confused investor! !